Not a lot went right for Ken Hitchcock and the Blues on Tuesday night against the Devils. 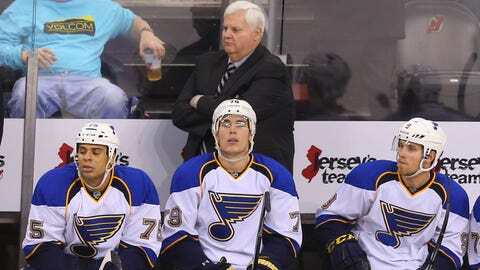 The St. Louis Blues reached a new low Tuesday night in New Jersey. The Blues’ 7-1 loss to the Devils stamped an ugly exclamation point on the worst stretch of the season for Ken Hitchcock’s club, which has now lost four of its last six games. "The sooner we forget about this game, the better off we will be. But sometimes you have to go back and look at a few things, and while it may be painful at first, there are lessons to be learned here," defenseman Kevin Shattenkirk told Bernie Federko during the telecast on FOX Sports Midwest. "We have a gut-check time during the season right now. We’re a couple weeks away from the break and we have to really bear down here and play some good hockey going into the break." This was a complete meltdown for St. Louis (33-11-5, 71 points), which allowed two goals in the opening 3 minutes and then surrendered goals within the first 2 minutes in both the second and third periods. The team hadn’t allowed seven goals in a game since the Ducks lit the lamp seven times on Jan. 12, 2011. The Blues are well aware of the issues that have plagued them this season, such as slow starts in the first period and not having enough players competing at a high level from game to game. They’ve talked about those problems but are still seeking solutions. This loss was embarrassing enough that it could serve as the wake-up call the Blues need.They certainly have enough talent, considering 10 players were selected for their respective countries’ Olympic teams. The Blues fell to 5-10-2 when their opponent scores first and are now 2-5-1 in the second game when playing back-to-back nights. New Jersey (21-19-11, 53 points) entered the game ranked 27th in the NHL in scoring with 2.3 goals per game. The Devils hadn’t even scored six goals in a game this season before Tuesday night. They hadn’t scored seven since April 10, 2010. The Blues’ lone highlight came when Alexander Steen scored a first-period goal on assists from David Backes and Jaden Schwartz. The goal was the 25th of the season for Steen, a career high. But whatever optimism was generated from Steen’s goal, which cut the early deficit to 2-1, was erased soon after when 41-year-old Jaromir Jagr scored the 697th goal of his career. It was apparent then, if it wasn’t already, that the Blues were in for a rough night. St. Louis switched goalies, with Brian Elliott going to the bench and Jaroslav Halak taking his place, but it didn’t matter. Nothing worked for the Blues. They struggled offensively, defensively, in goal and on special teams, where they allowed a season-high-tying three power-play goals. "It was a tough game out there and no one’s happy with it," Shattenkirk said. "But we have some time to regroup here, and we’ve got a chance to play on a big stage in Madison Square Garden and show everyone the type of team we are." For much of the season, the Blues established themselves as one of the best teams in the NHL and looked like a legitimate Cup contender. But during this six-game stretch, which started with the loss in Vancouver and included the back-to-back home losses against the Kings and Ducks, the team’s issues have come to the forefront. There is plenty of time to fix them — if they learn from their previous mistakes.